The VCAP5-DCD Official Cert Guide presents you with an organized test preparation routine through the use of proven series elements and techniques. “Do I Know This Already?” quizzes open each chapter and enable you to decide how much time you need to spend on each section. Exam topic lists make referencing easy. Chapter-ending exam preparation tasks help you drill on key concepts you must know thoroughly. 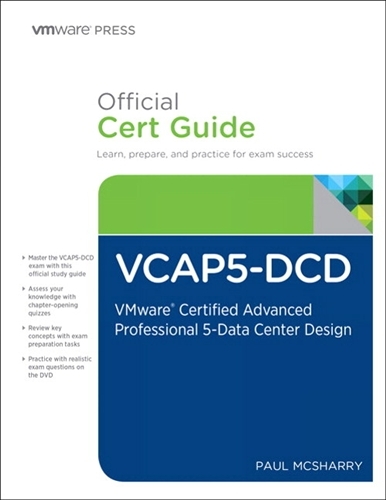 The VCAP5-DCD Official Cert Guide focuses specifically on the objectives for the VMware Certified Advanced Professional 5–Data Center Design exam. VMware Certified Instructor (VCI) Paul McSharry shares preparation hints and test-taking tips, helping you identify areas of weakness and improve both your conceptual knowledge and hands-on skills. Material is presented in a concise manner, focusing on increasing your understanding and retention of exam topics. The VCAP5-DCD Official Cert Guide is part of a recommended learning path from VMware that includes simulation and hands-on training from authorized VMware instructors and self-study products from VMware Press. To find out more about instructor-led training, e-learning, and hands-on instruction offered worldwide, please visit www.vmware.com/training. PAUL MCSHARRY (VCP, VCAP, VCI, MCSE, MCITP, CompTIA CTT+ and Microsoft MCT credentials), has more than 15 years of IT experience and is an independent virtualization consultant and instructor based in the United Kingdom. When not working in the field, he is often found instructing VMware-authorized classes for various VMware authorized training providers. He has been awarded the vExpert designation for his work within the VMware community and blogs at http://www.elasticsky.co.uk.